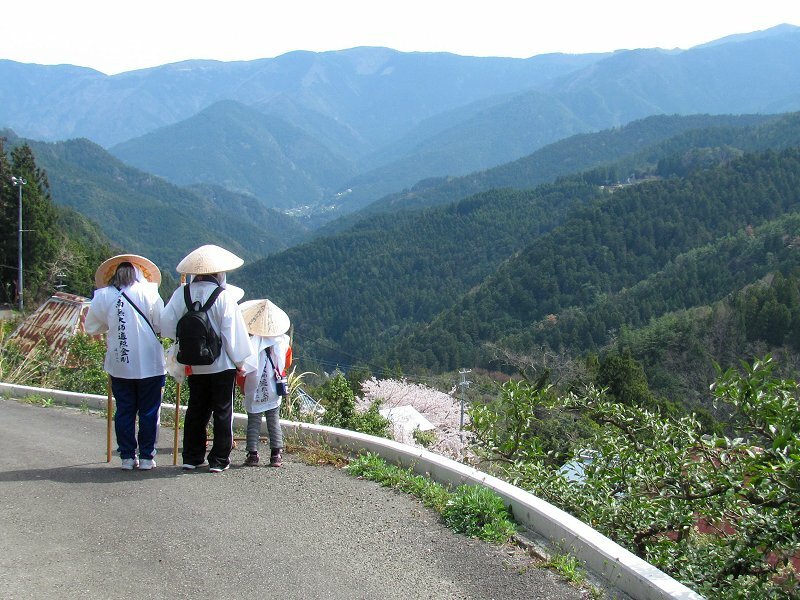 Pilgrims (henro) arriving at Fujidera (Temple 11) in the foothills of the mountains south of the Yoshino River Valley. 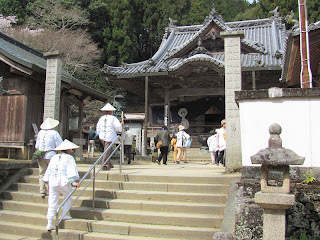 Here, I received my first o-settai (a gift to a henro) from a little girl who was distributing them to pilgrims with her family. 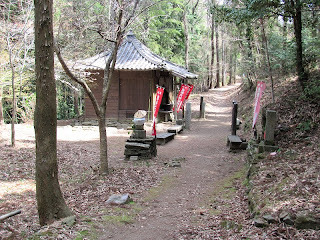 My o-settai was a small bag filled with a canned beverage and snacks for the trail! 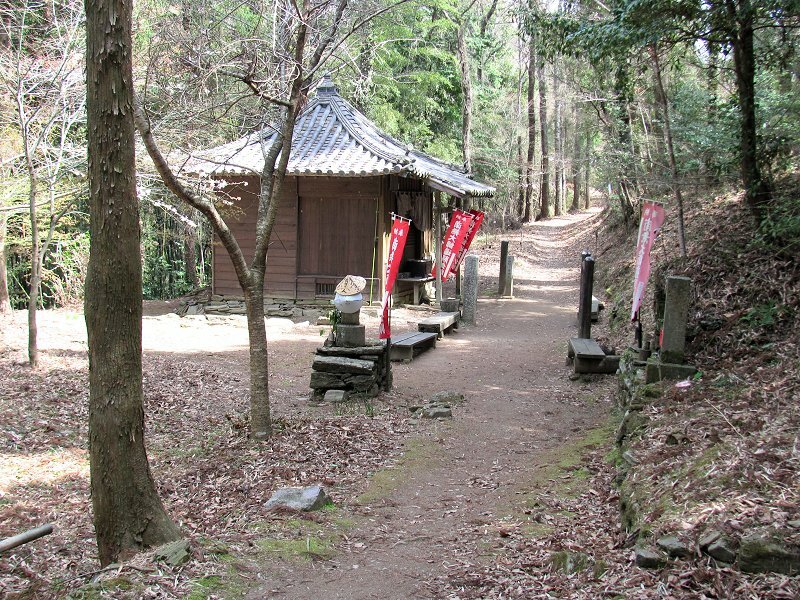 The trail, signed to Shosan-ji (Temple 12), leaves the temple compound at Fujidera. 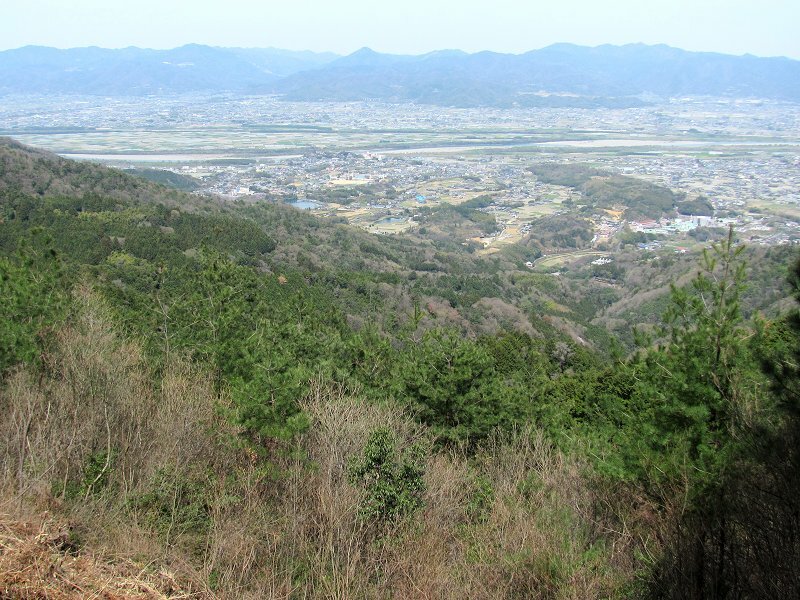 After gaining a bit of elevation, a fine view opened up across the valley of the Yoshinogawa (Yoshino River). 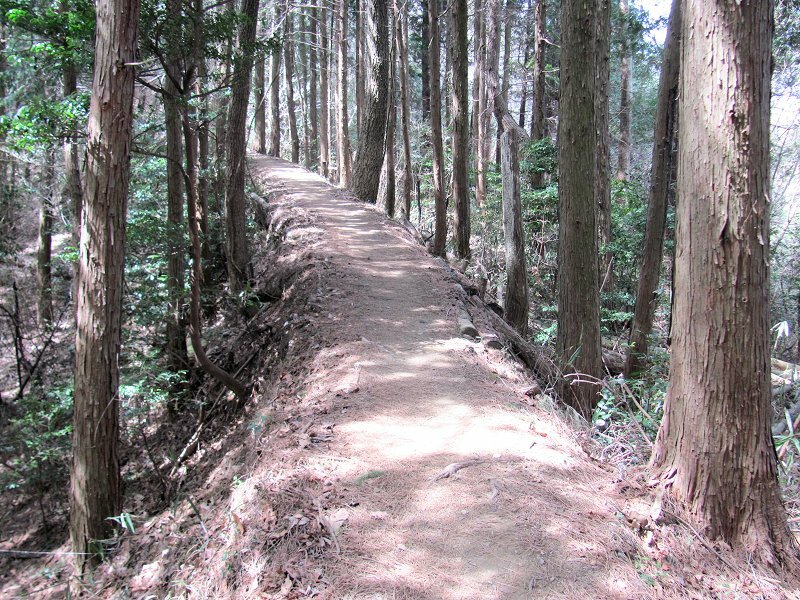 The trail climbs steadily from Fujidera finally reaching the crest of a ridge. 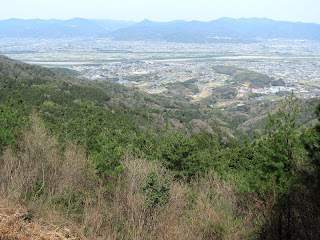 Shortly thereafter, I came upon the small ridge-top shine of Chodo-an. 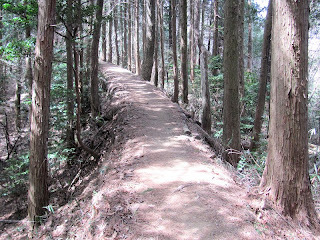 From Chodo-an, the trail continued along the forested ridge. 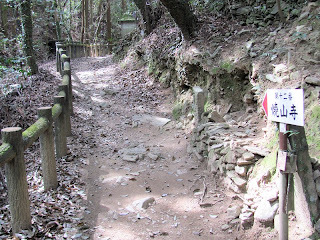 On this section, much of the path was level or gently undulating. Here's a particularly nice section of the trail. 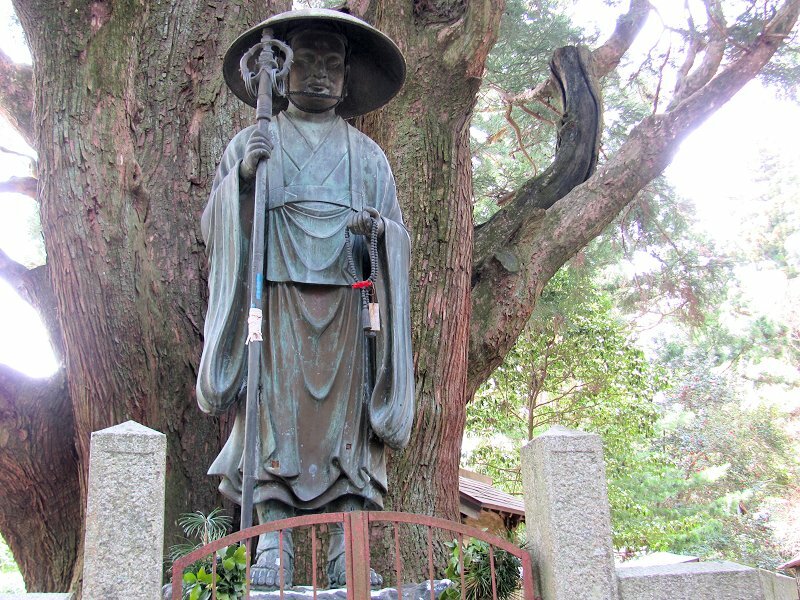 After awhile the path began a steady descent to the shrine of Ryusui-an. 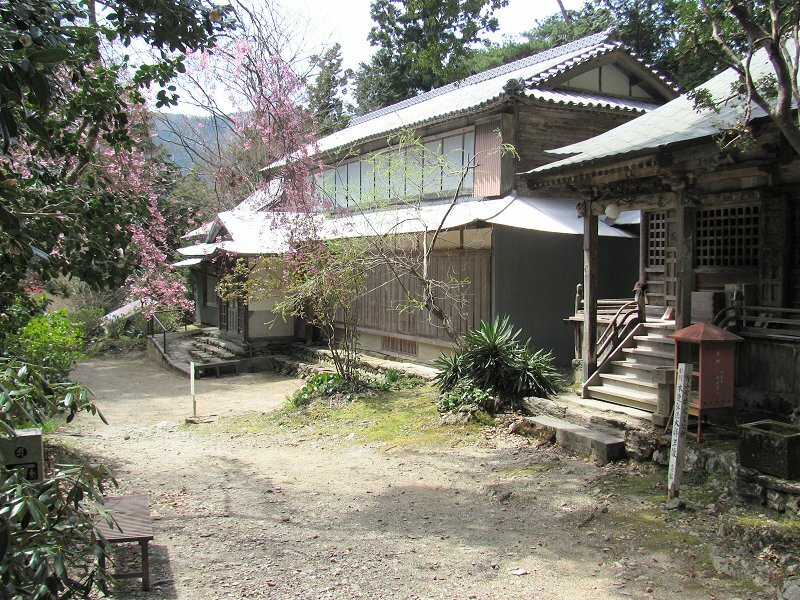 At Ryusui-an shrine, a cherry tree was blooming. Actually the forested hillsides all around me were speckled with flowering cherry trees, but I couldn't find a good spot for a clear photo. After Ryusui-an, the trail pitched upward again, climbing to reach this statue of Kobo Daishi in front of a very large cedar tree (known as Ippon Sugi) at the shrine of Joren-an. The path then descended into a stream valley reaching a farm road near fruit orchard. 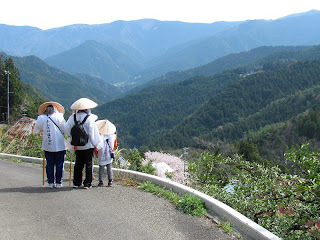 Here, I saw a family on henro on their way to Shosan-ji. 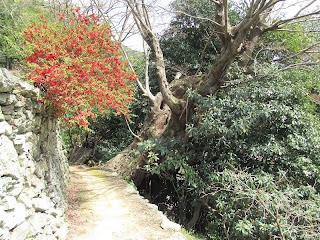 Flowering quince beside the path as I passed through a small farming village on the last stretch to Shosan-ji. The final uphill push to Shosan-ji. 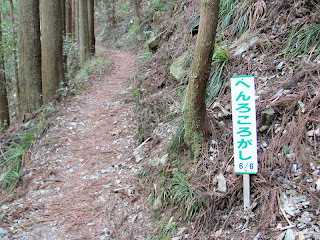 It was uphill all the way, but I set a steady pace, didn't stop and was up at the top before I knew it. The sign reads henro korogashi ("where the henro falls down"), a reference to the steep nature of the path. Finally, the beautiful mountain temple of Shosan-ji. 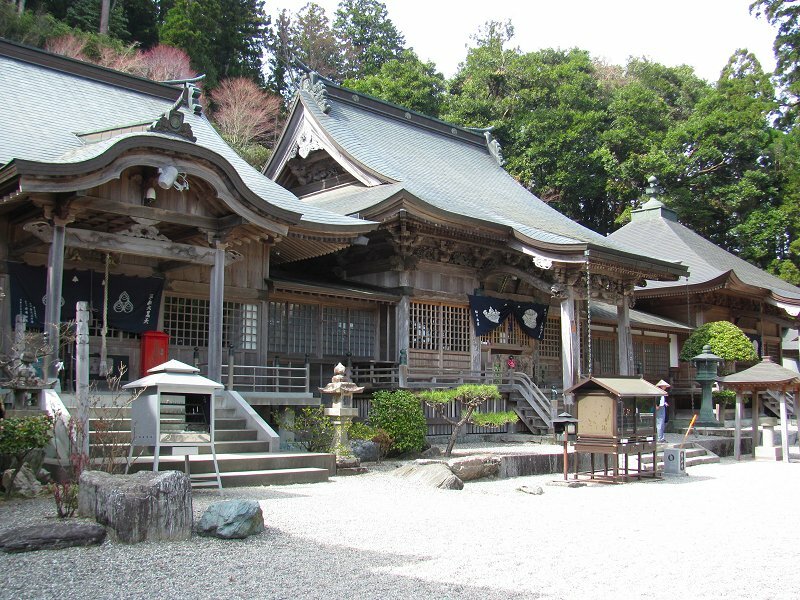 I made the hike from Fujidera to Shosan-ji in 3 hours and 50 minutes.